Many of us find that trying to balance our jobs and our home life is a constant battle between hitting deadlines, family time and hastily scheduled drinks with friends. For Jenny and Anthony, creating that balance was a key reason for their big house move. ‘We both grew up in small towns in Greece, so we were after a slower pace of life,’ Jenny explains. 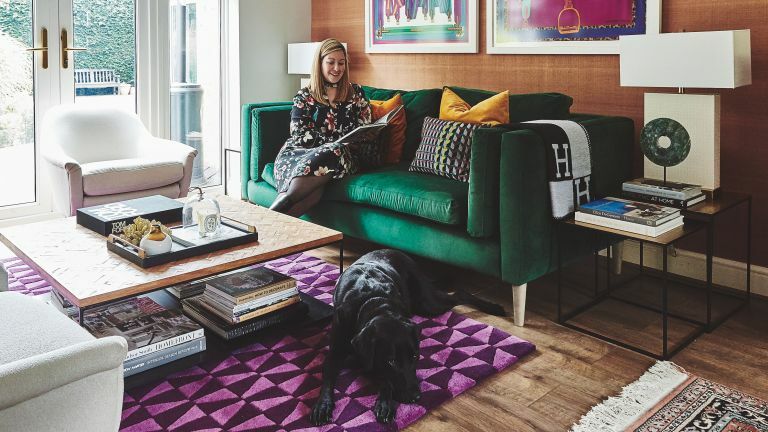 ‘After a full day in London, we wanted to come home to a relaxed environment.’ In the two weeks between getting the keys and moving in, Jenny and Anthony tasked themselves with bringing the house up to scratch. Find out how she did it, then browse all our real home transformations. For practical advice on how to renovate a house, read our essential guide. When the couple did start decorating, Jenny was full of ideas. ‘We’d lived in rental properties for so long, where you can’t add any colours other than black, white or magnolia,’ she says. Jenny’s black and white office was inspired by a mural she won in a competition – a monochrome tree design with a linen texture. She initially wanted an extended desk space, but the quotes she got from joiners were out of her budget. She’s convinced that the trend for gallery walls will give way to something more considered. ‘I think bigger artworks, limited-edition paintings or originals are going to be the way forward,’ she says. ‘We’re going to get tired of having busy walls. A big part of Jenny’s design is about luxury. The mid-century furniture and Art Deco touches around the house certainly evoke sumptuousness – including the bedroom, with brass wall lights and a light pink velvet scalloped bed from DFS.